← Pretzel is PCT Bound! Here at Mountain Crossings we have seen first hand what the misuse and abuse of the trail can lead to. In 2012, a camping restriction was placed on the five-mile stretch of trail south of Mountain Crossings requiring campers to carry a bear canister in order to stay over night between March 1 and June 1. Leading up to implementing this new rule, interactions between hikers and bears had spiked with the influx of thru hikers passing through the area. Bears in search of food in the early spring began to learn that they could count on the poor backcountry manners of thru hikers to supplement their diets. Without diligent efforts to uphold Leave No Trace practices, this began the first and only section of the Appalachian Trail to have a bear canister restriction. 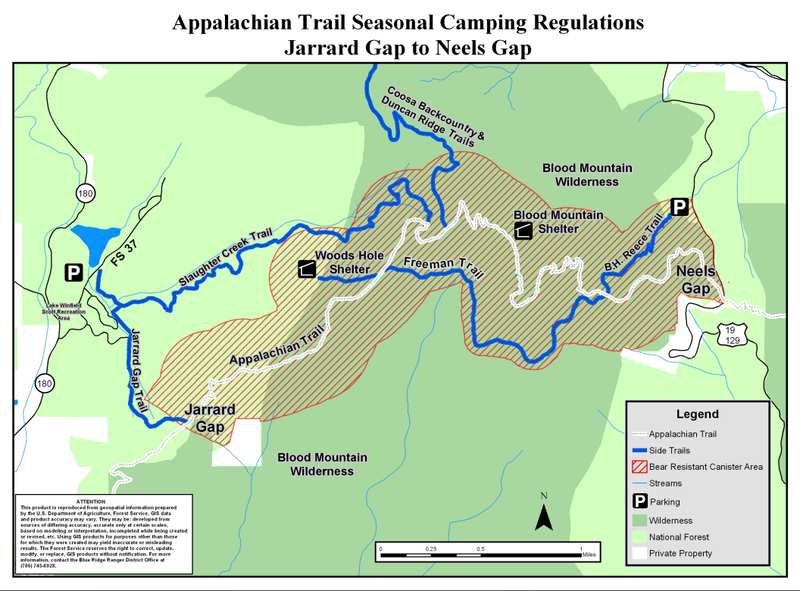 5 Mile section of trail from Jarrard Gap to Neels Gap where a bear canister is required to camp between March 1st and June 1st. Leave No Trace is an outdoor ethics program that has formed a set of guidelines widely accepted by all as proper and responsible use of the outdoors. The most important of these for thru hikers would be camping on designated or durable surfaces, disposing of all trash and waste properly, lowering campfire impacts and respecting wildlife and other hikers. 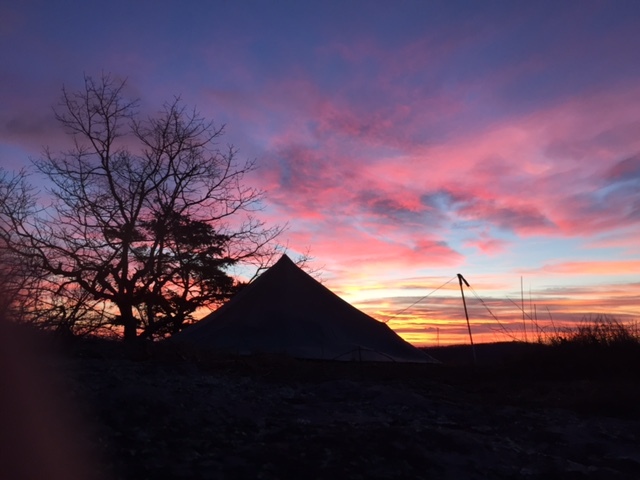 During their time on the Trail, many hikers come across the need to “stealth camp” Stealth camping is pitching a tent or hanging a tent in a area that is not a pre-designated camping area, such as at a shelter or campsite. When this situation arises, it is very important for the camper to choose a spot in which the impact of camping will be as little as possible. A bed of pine straw is both comfortable and resilient in comparison to a patch of wildflowers. Be mindful in your campsite choices! MTX Staff’s favorite camp site. It’s a secret spot and we are set on cleaning it up every time well enough that it looks like no one has ever camped there. That’s how you keep your spot secret! The proper disposal of waste and trash means packing out ALL trash. Burnables such a non-waxed paper and non-inked cardboard make a great fire starter but that does not extend to Ramen packages and candy wrappers. DO NOT burn your trash. Pack it all out. As for human waste, bury all solids in a six inch deep cat hole and pack out all toilet paper and hygiene products. 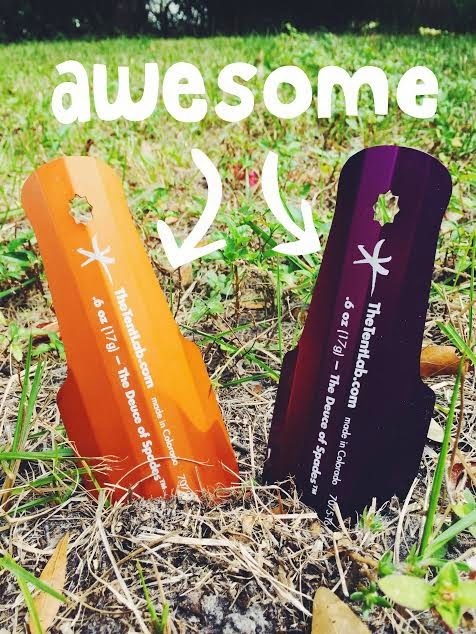 The Duce of Spades is our favorite trowel on the market. These guys are SO light weight and we love that! They also come in excellent colors and make it super easy to get the proper cat hole depth. Many shelters and designated camping areas along the Appalachian Trail have a ring built for fires. Do not build a fire ring where one does not already exist. Do not burn anything in the fire besides firewood, If you are collecting wood, pull from a large area of land and only take dead, fallen branches. Always make sure to be aware of fire restrictions in your area when building a fire and be mindful of the surrounding wind conditions. This is what most campfire rings on the AT look like at shelters and other campsites. 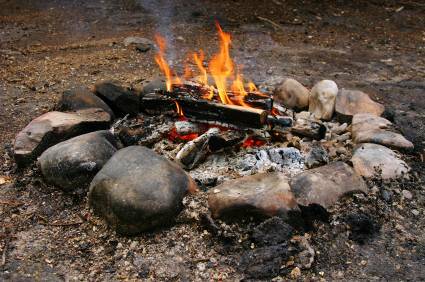 Be mindful of any dry brush around the fire ring and how big your fire is getting. One of the top ways to respect wildlife is to not intrude into their normal life. Do not touch or pick up animals found along the trail. Do not disturb nests or habitats of animals. Most importantly, properly hanging your food bag will deter bears and other mammals from coming into camp and getting a free snack. As for fellow humans, be conscientious of your surroundings and mindful of how your actions affect others. Be quiet when arriving to or leaving camp late or early. Do not cook inside of shelters. Do not take up excessive amount of space in shelters. 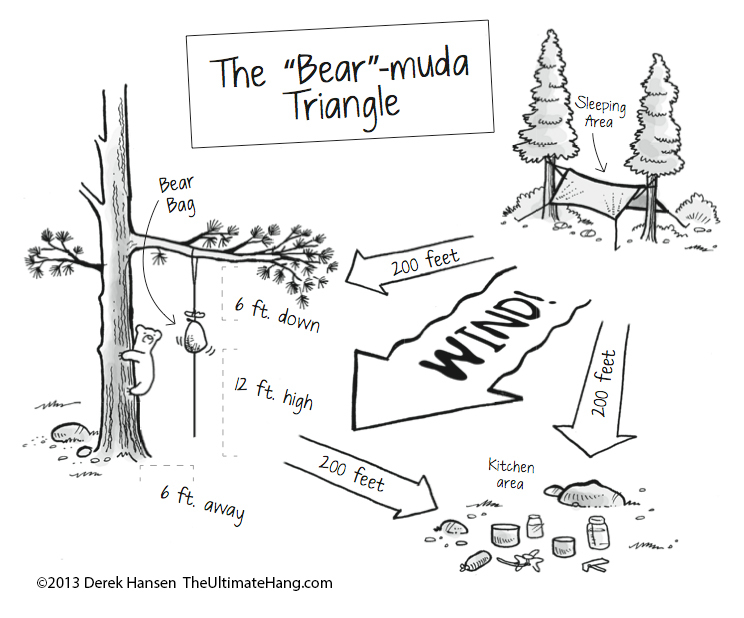 A cute little cartoon depicting a good bear bag set up. But don’t leave your dishes out overnight! In a nutshell, the Leave No Trace practices, known as LNT, are simply urging folks to be a respectful and mindful person when in the outdoors. It is a shared space and a precious and irreplaceable one at that. Think of how your actions effect the wilderness and those who also wish to enjoy it. This entry was tagged appalachian Trail, Campsite, Day Hiking, hiking, Impact, Leave No Trace, mountain crossings, Neel Gap, Section Hiking, thru hiking, Trash, Waste. Bookmark the permalink.